Architura’s Principals Michael Conly and Charles Kotterman worked with Greenwalt Corporation to develop Grand Park Village, a 40,000 +/- SF retail and office complex adjacent to Grand Park (400 acre/$45 Million sports complex in Westfield, Indiana). Grand Park currently has roughly 1.2 million visitors per year, and it is expected to grow to nearly 3 million in the next few years with traffic year-round. 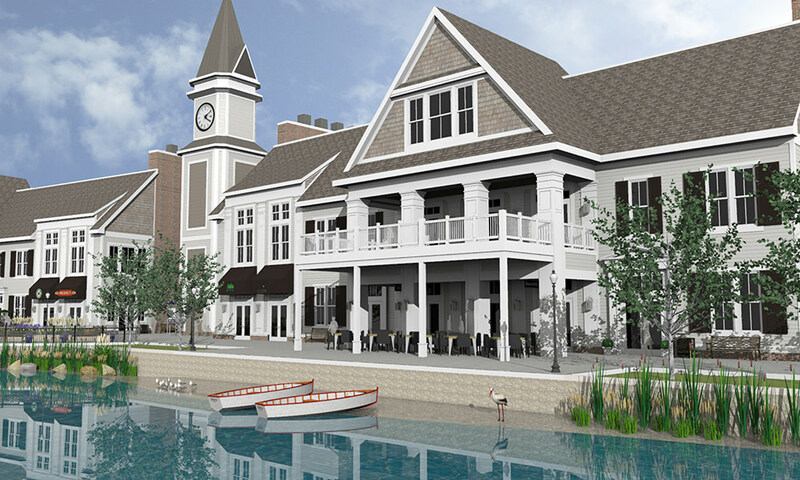 This beautifully planned and designed facility will have Cape Cod architectural elements, a boardwalk on the new 12 acre lake and will provide outdoor seating for restaurants, open space for community events and performances, and a large clock tower that will be visible from most of Grand Park to anchor the retail center and draw customers to the site. Grand Park Village is within walking distance to the Monon Trail extension.